My approach to research is very simple (lmentary). I do not offer a series of standard packages (gold, silver, bronze etc.). Instead I tailor the package to your specific needs. No search is too big (or too small) and the scope of the task is agreed between us before any work can commence. 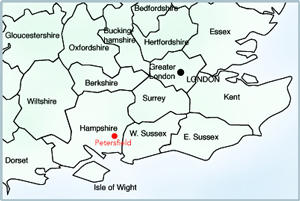 Hampshire, Sussex and Surrey is the geographical area in which I can search local records and I regularly visit the National Archives to access the vast array of national treasures held there. I will also consider searches beyond the boundaries just described as the Internet provides easy access to millions of records.